Mastermind is played by two opponents. 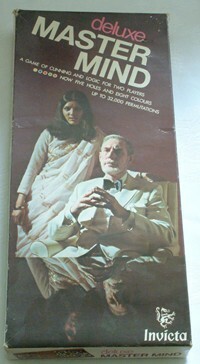 One sets a secret code of four coloured pegs, whilst the other tries to guess it. The code setter, marks his opponents attempts with white or black pegs, indicating correct colour or correct colour and correct position. The Word Mastermind game replaced the coloured pegs with letters and Number Mastermind used numbers instead. Deluxe Mastermind offered a code made up of 5 coloured pegs chosen from 8 colours; a total of 32,000 permutations. Super Mastermind was similar to Deluxe Mastermind, but with different packaging. Mini Mastermind was a pocket version and Mastermind 44 was for four players, rather than two. When more versions came onto the market, the original Mastermind was later packaged as 'Original Mastermind'. In the 70s, pocket calculators and digital watches were capturing the public's imagination. Toy and game makers were not far behind in exploiting this futuristic market. 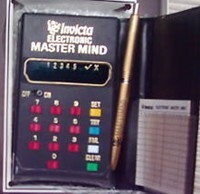 In 1977 Invicta joined the electronic games market when they launched Electronic Mastermind. Electronic Mastermind looked like a pocket calculator and it used similar circuitry. The code was now a number rather than a series of coloured pegs, but the principle was the same. If you fancy indulging in a spot of 70s nostalgia or getting to grips with a serious mathematical puzzle, then Mastermind can be found on eBay for a few pounds. Pay between £5 and £10 for an Original Mastermind. Deluxe and Super Mastermind also sells for similar prices. Electronic Mastermind can be worth a bit more - £10 to £20. This is really a bargain compared to how much some electronic toys from the 70s can be worth. It is sure to rise in value.